Burlington High School Principal's Blog: Congratulations To The BHS Cheerleaders For Their 8th Consecutive State Championship! 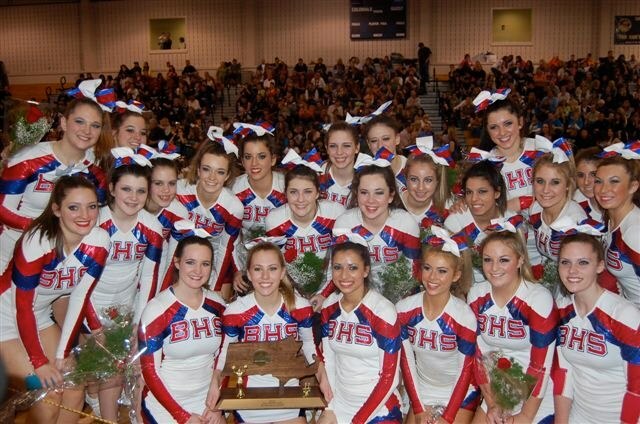 Congratulations To The BHS Cheerleaders For Their 8th Consecutive State Championship! Congratulations to the BHS Football Cheerleaders who captured their 8th consecutive Massachusetts Division 3 State Cheerleading Championship yesterday at Shrewsbury High School. Check out some of the other great photos of our State Champs below and stay tuned for a video of their award winning routine after our Pep Rally On Wednesday. Way to go BHS Cheerleaders!! You're THE best!! Congratulations!! !